If you are applying to work as an event coordinator, your resume should highlight skills and experience specific to that type of work. The PDF template provided here shows how you can bring relevant experience to the attention of hiring managers in an attractive resume format. 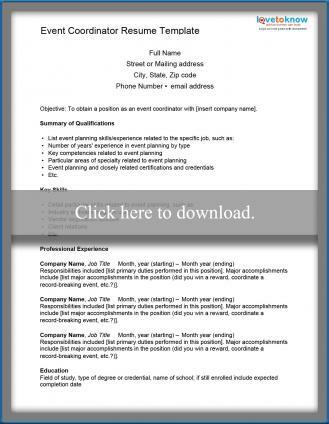 The free customizable resume template provided here can be used as a guide to complete your own resume targeted to an event coordinator job. Simply click the image to access the document. Once you have opened the template, you will be able to add, save and print information about your background. Note that the title line and LoveToKnow logo will not print. See the Guide for Adobe Printables if you need assistance working with the form. Click here to download resume template. Objective - When submitting your resume in consideration for a specific job, tailor the objective to the particular job and company. You can also have a version of the resume with a general objective that you can use to distribute at networking events. Summary of qualifications - This should include particular accomplishments that qualify you to work as an event planner. It can include things you accomplished at work, as well as through civic, community or charity work. Also include information about the types of events you have planned and how many years you have planned events. If you have an event planning certification, list it here as well. Key skills - Use this section to detail specific skills you have that will appeal to employers hiring event planners. For example, if you have outstanding organizational skills, persuasive communication skills, writing abilities, media relations, volunteer management, and any other skills that would be particularly beneficial to a professional event planner, include them here. Professional experience - This section should detail your work history. Start with your current job and move backwards, including any positions that highlight specific event planning experience as well as other types of positions to demonstrate your overall work history. If most or of your experience has been non-paying, you could instead title the section 'Relevant Experience'. Education - If you have a degree, or are working on a degree, list that information here. If your education is specifically related to event planning, you may want to move this section higher in the document. For example, if your education is in a related field - like hospitality management or public relations - and you don't have much (or any) professional experience in the field, move education so that it is above professional experience. If you have not attended college but have graduated from high school, you can list that information here if you desire. Save your completed template so that you can easily adjust it for different positions or update it as your experience changes. This will enable you to quickly prepare and submit your resume for future event planning jobs as you learn about them.